December 6, 2018 / Modified dec 6, 2018 4:58 p.m. Different apples need different controlled storage environments. For example, Honeycrisps are sensitive to low temperatures so you can't put them in cold environments right after they've been harvested. And Fujis can't take high carbon dioxide levels. Walk into a U.S. supermarket on any given day and you're pretty much guaranteed to find apples. In our globalized economy, we expect nothing less than to be able to consume our favorite fruits and vegetables all year, even when they're not in season locally. Placing strawberries from Mexico in your shopping cart in February and stocking up on kiwis from Chile in July – that's pretty much normal, even expected. But to buy an apple in March? That's a whole different story. We rarely need to go overseas for that. Only 5 percent of the apples consumed in the U.S. are imported, according to the U.S. Apple Association. That means most of our apples are picked from trees in Washington, New York, or Michigan – three of the country's largest apple-producing states – and they are picked during fall harvest. Harvest season for apples in the U.S. depends on the variety and the state, falling somewhere between early August and mid-November. So if it's March, your apple was likely harvested months ago. Yet it still tastes pretty fresh. This wasn't always the case. "It's something we take for granted now," says Chris Watkins, a professor of horticulture at Cornell University and the director of Cornell's cooperative extension. During harvest season, Watkins and post-doctoral students drive a truck to farms all over New York state to collect apples and bring them back to their lab at Cornell. There they study how the apples react under different storage conditions. According to Watkins, we have a technology called Controlled Atmosphere (CA) storage to thank for being to eat an apple whenever we please. 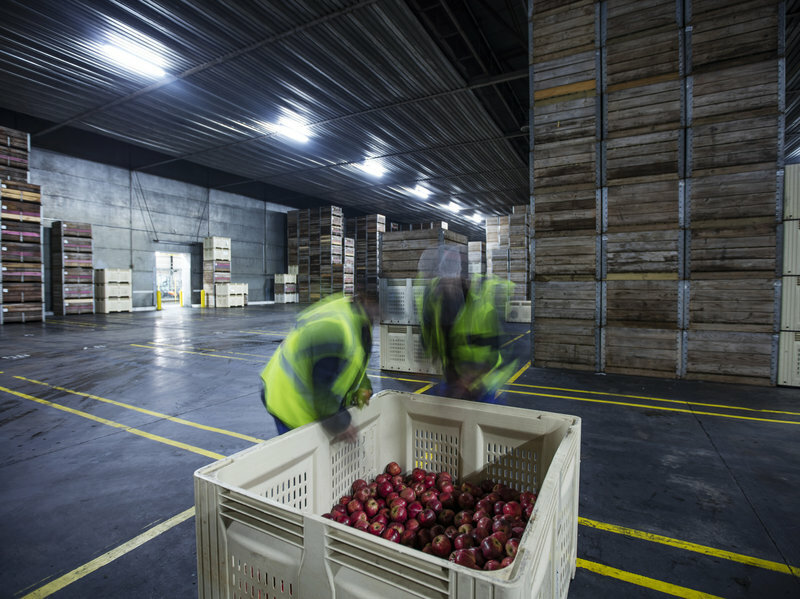 In CA storage rooms, the temperature, oxygen, carbon dioxide, and humidity levels are adjusted to form hospitable hibernation environments for apples being stored after harvest. "The whole idea is to put the apple to sleep," Watkins says. The perfect combination of temperature and gases, which differs for each variety, allows apples to stay fresh for longer after harvest than if they were simply refrigerated. Commercially refrigerating apples only preserves the fruit for a few months before it gets soft and dehydrated. And just keeping them in your home refrigerator? They'll likely only stay fresh for a few weeks. The concept of controlled atmosphere storage is not entirely new — modified atmosphere storage for food dates back to the 1800s. But the impetus of research for the facilities that we have today came from Cambridge University in the 1920s. The technique was improved when Robert Smock, a researcher in Cornell University's pomology department, visited Cambridge in the late 1930s to observe the groundbreaking CA technology developed there. Smock, who studied post-harvest technologies for apples, pears, plums, and peaches, was trying to figure out how to extend the shelf life of the fruits. Smock brought what he learned back to New York and adapted CA to work for local apple varieties, focusing on how to make McIntoshes last until the spring. In his laboratory nestled in a barn near Cornell, Smock experimented by placing apples in sealed rooms at different temperatures and with various mixtures of oxygen and carbon dioxide to see how the fruit would respond. As a result of Smock's work, the first CA rooms in the U.S. were built in New York in the 1950s, and shortly after, the apple consumption season extended to the springtime nationwide. Controlled atmosphere is so widespread today that Watkins estimates that almost every apple you see in a grocery store out of season will have been, at some point in its lifetime, subjected to it. "The apple industry as we know it today would not exist without CA," Watkins says. The Crist family farm in the Hudson Valley, New York, is just one example. Jeff Crist is a fourth-generation apple farmer and storage facility manager at Crist Brothers Orchards. He estimates his family built their first CA storage facility shortly after Smock made his post-harvest research available for commercial use at Cornell, just an hour's drive away. At the orchard, 400,000 apple trees line different patches of the 550-acre property. The Crists grow apples for large retailers and grocery stores east of the Mississippi River from Florida to Maine – think Giant and Costco. And their storage facility allows them to get all of these apples to market when there's demand, not just in the fall. The Crists' CA storage facility has 30 rooms, each one 40- by 80-feet with 20-foot-high ceilings. The rooms are sealed with foam panels and lined with modern sliding doors. Each of the 30 controlled-atmosphere rooms can fit a bunch of apples — 1,400,000 to be exact. The rooms fill up quickly during harvest time when employees bring in loads from the fields. From August to November, "every four to eight days, we're filling a room," Crist says. Then, when the doors slide shut, Crist turns on the CA system right from his iPad. With the touch of his finger, he activates the coolers, lowers the oxygen in the room to about 1.5 to 2.5 percent (ambient oxygen is about 21 percent), and adjusts the carbon dioxide, essentially putting the apples to sleep. When they're surrounded by less oxygen and more carbon than found in air, apples don't have enough energy to complete the ripening processes, says Jim Mattheis, a researcher at the USDA's Tree Fruit Research Laboratory located in Wenatchee, Wash. That's because like humans, apples breathe, taking in oxygen and releasing carbon dioxide. "You're physiologically affecting the ability of the fruit to get ripe," Mattheis says, when you place apples in CA storage. "The lower the oxygen, the sleepier we can make the apples," Watkins adds. Sleepier apples have slower respiration rates and stay firm, colorful, flavorful and nutritionally dense for longer. The trick is to avoid bringing the oxygen levels too low, otherwise the apples will ferment. But not all apples ripen quite the same way, so figuring out the right way to do CA is kind of like a puzzle. "Apples are like people – they are not all the same. One recipe for growing doesn't work with all the different varieties, and it's the same in the post-harvest environment," Mattheis says. Some varieties are notoriously trickier to care for. For example, Honeycrisps are sensitive to low temperatures so you can't put them in cold environments right after they've been harvested. And Fujis don't always react well to high carbon dioxide levels, so you have to monitor them closely. With new apple varieties being developed frequently, post-harvest researchers like Watkins and Mattheis are hard at work. In their labs they test out what type of CA environment works best for these newly bred varieties. Then they take their research to growers like Crist so that when they open their CA rooms as the market demands, their apples are good-looking and tasty. Scientists at the Washington Tree Fruit Research Commission, also in Wenatchee, Wash., are working on breeding new varieties of apples that are specifically designed to maintain their quality in storage. Cosmic Crisp is what they're calling one they're particularly proud of. It's a cross between Enterprise and Honeycrisp apples, and it's been bred to last 12 months in CA storage, or even six months in refrigerated storage. They expect it will be available to consumers in 2019. Ines Hanrahan, the director of the Washington Tree Fruit Research Commission, says post-harvest research is a lot like figuring out how to treat a patient. The researchers want to know how the apples will behave if they've been grown or treated in a certain way. The goal is figuring out how to keep the patient — in this case, the apple — alive for longer, Hanrahan says. Rachel D. Cohen is an intern on NPR's Science Desk.